RealSize app´s objective is to provide a solution to the Size Perception problem transforming the iPad into a kind of virtual reality box where you can view an actual size replica of the object. It also provides an easy method enabling you to create this replica by yourself in a few minutes. Are you sure that by looking at a picture of an object you can determine its size? Are you sure that by looking at an object you can determine its size? Of course, I do this continuously in my daily routines. What a strange question!. Are you sure that by looking at "a picture" of an object you can determine its size? Let´s do a small test related to your Size Perception skills. What do you think is the real size of this hat? Probably you brain is in an abstract thinking mode: What is the problem?. 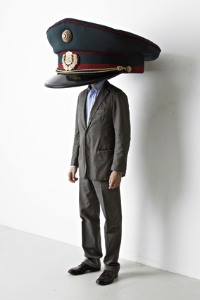 Your brain assumes it is a normal hat, and is the normal size of a hat, proportional to a normal human head. But... wait! it is just a picture, it can be the hat of a toy, or part of a kid's costume, also there are small heads and big heads. What do you think is the size of this hat? The body of the man acts as a reference, and your brain will tend to think again that it knows the answer. Probably it fails a second time: the man in the picture can be a tall basketball player of 2.30 meters, or a small jockey of 1.50 meters. If you are a basketball player you will tend to think that it is bigger than it really is, and if you are a jockey, the reverse. Then, even with this second picture, the estimation can be inaccurate and the real hat can be 50% bigger or smaller than the one in your mental image. Why does our brain have this tendency to overestimate size perception? Perhaps this is because the size perception mechanism of our brain was developed several million years ago, when pictures didn't exist. How does our Size Perception mechanism work? The size perception of an object works not by analyzing the object itself, but its surrounding context. This can be the environment, objects close by, or also previous experience with similar objects. 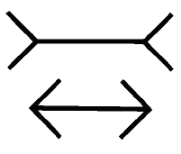 This perception mechanism characteristic is the reason for several optical illusions such as those shown at the bottom of the page. Our world is full of images. What strategies are used to help us estimate the size of an object in a picture? The manufactures of the product usually provide in the specifications, dimensions in mms. Now, with a ruler and the exact measurements, we can try to estimate the real size. This is a good solution, but it is not very meaningful. Images showing the object held by hand. This seems helpful, but it is in fact very confusing: there is a lot of variation in hand sizes. If someone is trying to sell you a burger you will probably never see an image with large hands holding it. Images showing the object close to a known object, such as a credit card, a pencil or a coin. This is a very intuitive way, but they are not very common. Some optical illusions based on the limitations of our Size Perception mechanism. The lower horizontal line looks shorter than the upper one, but they are identical. 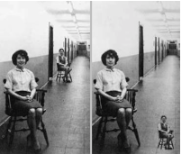 The smaller woman on the right in both photos is the same size (measure her), but she seems smaller in the right hand photo because her size is estimated from the environment. 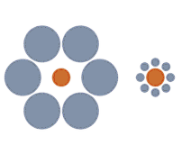 The orange circles are the same size, but the one on the right looks bigger just because it is surrounded by smaller circles.